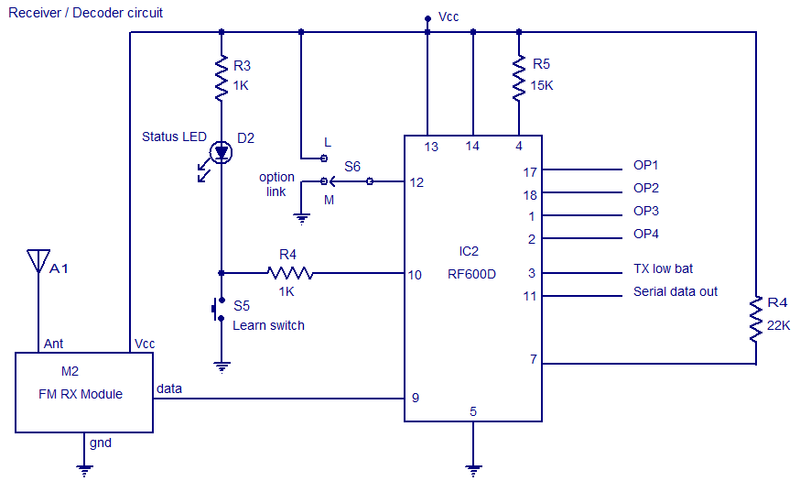 Here is the circuit diagram of an FM remote encoder/decoder using the ICs RF600E and RF600D. These devices are designed to provide a high level of security and operates from anything between 2 to 6.6V DC. Various electronic circuits like remote control systems, remote alarm systems, anti theft alarms etc can be implemented using the RF600E/RF600D pair. The remote systems given here uses FM for the transmission. IC1 RF600E and its associated components form the encoder circuit. Pins 1 to 4 forms the switch inputs of IC1. When each push button switch is pressed a corresponding code will be generated at the pin 6 which is the data output pin. The encoded signal available at pin 6 is buffered using the transistor Q1 and the fed to the input of a general purpose FM transmitter module (M1). Such FM transmitter modules are very common in the market now. The decoder system comprises of the IC2 RF600D and its associated components. Pins 17, 18, 1 and 2 are the digital data output pins of RF600D corresponding to the input switches S1 to S4 of the encoder/transmitter circuits. The digital data output pins 17,18,1 and 2 are asserted low when the relevant inputs S1 to S4 on the IC2 RF600E are asserted. M2 is a general purpose FM receiver module which receives the transmitted code and feds it to the data input (pin 9) of the IC2. Switch S1 can be used to select between latching and momentary digital output function. In latching mode digital output pins (OP1 to OP4) are only asserted for the corresponding transmit signal. In latching mode the output state is changed on each corresponding transmit signal. The learn switch S5 is used to enter the decoder IC in to the â€œlearn modeâ€. Learn operation using push button switch S5 is as follows. 1) Press and release the push button switch S5. 2) The status LED D2 will glow when S5 is pressed and will remain ON when S5 is released. 3) Operate the encoder/transmitter once. 4) The status LED D2 will become OFF. 5) Operate the encoder/transmitter again. 6) The status LED will start flashing. 7) When the flashing of status LED stops, the encoder will be successfully taught to the decoder and the transmitter/encoder will now operate the receiver/decoder system. Up to seven encoder/transmitters can be learnt to each RF600D.Pin 3 of IC2 is the transmitter low battery indicator output and pin 11 is the serial data output. 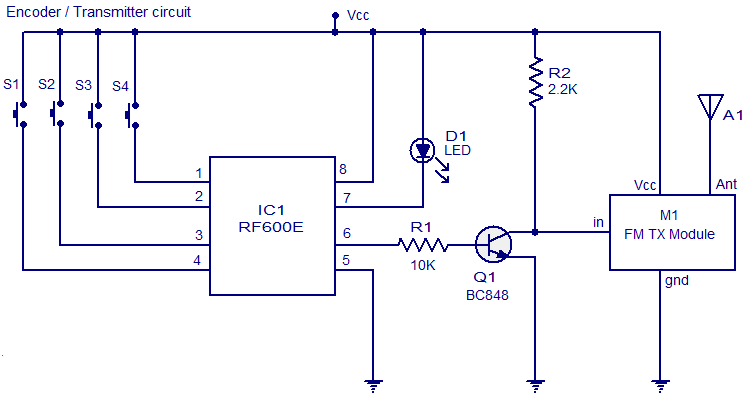 The ICs can be operated from anything between 2V to 6.6V. Switches S1 to S5 are miniature push button switches. S6 can be a miniature two way switch. Transmit LED D1 will glow whenever the encoder is transmitting. The power supply must be properly regulated and ripple free. I recommend using batteries for powering the circuit. Go through the datasheets of RF600E and RF600D before attempting this circuit. Pls tell me how to make a ir simple transmiter and resiver circuit with photo ,Thank you. it’s very nice and i want more mini project like this…..
and also this operation to fly a robot with wireless camera. can we do this by FM controlling? if yes then please help me and provide me a necessary article for it . with circuit diagrams of both. send me mail with necessary articles. Hi JD ,ok you can use it for a roboc such remot control,And for this you hab to add 4 transistor to control your motor backword and forword .Thank you. Hi.. What is the range of this circuit?? Hi Vijay .You will find all the components for the circuit around 150-200 rupies ablebel in indian markets. Sir I want to know about it’s range. i wish to use your circuit for my foward reverse motor cicuit.can i? Hi friends go through the notes, get into the link on RF600E & D which is quite elaborate. the dimension of antenna?and material of coil? which relay should be used at the output.? plz tell me the purpose of learn operation? can there is any alternative to use directly switch 1 to 4 ,to directly operate outputs.not to go throw learn operation. I wish to use the above NEW DEVICES in a circuit I am about to design BUT…I want to activate a 12 Volt relay for my premises alarm I plan to construct. Will we be able to use the RF600D and RF600C and then there is no mention what the FM TX Module is where are they obtainable from please be more specific then lastly..are you able to provide me with a CIRCUIT that will activate a 12 Volt relay perhaps?? ?